How to: Mitigate Risk and Increase the Safety of YOUR Flying! Risk mitigation and safety management systems are nice little “buzz” phrases I hear a lot in aviation these days. Many organizations and individual pilots are doing it right, but many are not, and that is a problem that needs to be addressed! I prefer to be known as a pilot to “call it” or make a “no go” decision early rather than later when compared to others. I believe there is a fine line of acceptable risk with proper mitigations and an unacceptable level of risk. An example would be frost on the wings after a chilly New England winter evening. I’ve seen many pilots hop in and take off, climbing into the sky with frost covering their aircraft’s wings. To contrast, I will not get into an airplane until all frost has been removed from any lift-producing surface (wings, flaps, ailerons, horizontal stabilizer, elevator or stabilator). Many pilots question my waiting for the sun to melt the frost or the frost clearing techniques I employ (rubber scrapper of sorts). My simple response is that Cessna or Piper or whichever manufacturer (produced the aircraft you’re about to climb into…) spent a great deal of money on research and design (R&D) while building the airplane. How is adding frost going to improve the wing design they mass-produced? After receiving a blank pause, I simply say, “You’re right, it doesn’t,” and I continue my frost removal. This is simple, taking off with frost covering the wing is a risk, one I deem not worth trying to test. The risk mitigation is simply removing the frost then going and flying, thus this is really risk aversion. Here is a better example of risk mitigation… One of my favorite fly-in restaurant destinations is A.K. Diamonds on Nantucket Island, the further east of the two Massachusetts islands south of Cape Cod. This 60 (or so) miles flight from Mansfield is a very scenic ride on a summer afternoon for a dinner flight. Making a “straight shot” from the Mansfield airport requires a very extended period of time flying over open water (read: outside of engine-out gliding range) for the single engine aircraft that I use for instruction. To me, this is a high level of risk; sure I can swim if we were to end up in the water. However, it’s New England, even during the late summer the water is chilly. Second, it’s not like walking out of my screened-in porch and jumping into my swimming pool. The swimming will be following an extremely stressful engine failure, attempted restart and subsequent water landing. How do I mitigate this risk of a potential water landing following an engine failure? By altering course and flying at 5,500 feet I can remain within gliding distance of land at all times! As a result, if the engine fails, the worst-case scenario is that I end up on a beach, at least I don’t have to worry about drowning, or the Great Whites… This is risk mitigation. I have slightly altered my course to remain in position to make it to land while gliding at all times. Based on some quick calculations, it is easy to see that my detour only adds approximately 5-10 minutes to my flight. If you read this blog regularly, you might remember my post a while back about avoiding straight in approaches and flying a full traffic pattern at a non-towered airport (Avoid Straight In Approaches). One of my main points was that pilots cheat themselves by making the straight in approach, as opposed to enjoying the extra flying of the full traffic pattern, which is why we fly, to enjoy the flying… In any event, this is a similar situation. Not only does the slight course alteration keep me within gliding distance of the shore, but also it gives me a few more minutes of enjoying the great vistas on the way to the outer Massachusetts’ island. 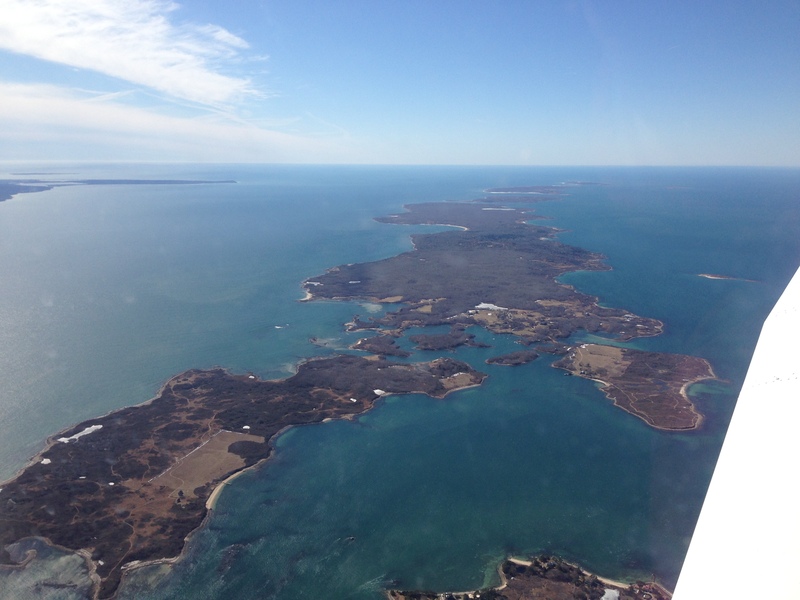 The Elizabeth Islands separating Buzzards Bay (right) from vineyard Sounds (left) make for some incredible views! This is just one example of mitigating risk, there are many, many more! Before your next flight think about all of the things that you will be doing, airports you will be visiting, what you will be flying over… Then think about what the potential risks associated with each item that comes to mind. Taking a few minutes to come up with risk mitigation techniques ensures that you are operating your aircraft in a safer manner. So my question is, why wouldn’t you want to operate with a higher level of safety? Seriously… Why wouldn’t you?